Peter Pretorius was born in Johannesburg, South Africa. In Death-Defying Faith, Peter recounts his childhood—a “riches to rags” story set in South Africa’s apartheid era. Based on extensive and up-to-date research with 50 top UK Christian entrepreneurs from a variety of business sectors. This unique book demonstrates and explains the history, motivation and contribution that Christian entrepreneurs are making through their work of producing high quality goods and services, promoting Christian values, witnessing to people in business, and giving generously to worthy causes. The book celebrates the work of Christian entrepreneurs but also challenges them, urging them to widen their vision and grasp their role in God's overall mission. It calls on church leaders to recognise, affirm and encourage entrepreneurs in their midst. Timothy Keller shows how God calls on each of us to express meaning and purpose through our work and careers. Power corrupts―as we've seen time and time again. People too often abuse their power and play god in the lives of others. Shady politicians, corrupt executives and ego-filled media stars have made us suspicious of those who wield influence and authority. WRITTEN BY A MAN FOR MEN – THAT WOMEN SHOULD READ TOO! "Healing Promises" takes you into the heart of our Lord Jesus and shows you on page after page of His compassion and willingness to heal you. that will inspire you to walk moment by moment with Jesus. 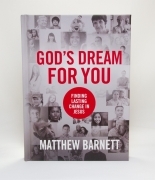 God's dream for you - original utg. Engelsk original utgave. This second edition of The NKJV Woman's Study Bible features new articles on Bible study by respected women such as Anne Graham Lotz, Nancy Leigh DeMoss, and Stormie Omartian.